Articles should be written on the author name and contact address. In addition, the names of the authors to suggest any special notes or phrases should be avoided. Author names written articles will not be considered. Articles DOC (Microsoft Word) should be prepared. In the entire article "Courier New" characters should be used. Paragraphs should be no space in the transition. Main text A4 format, and the top edge gaps should be set to be 3 cm. A4 paper should not be used horizontally. Turkish, English, German and French languages, one of the texts written in a simple language and words should be written, long sentences should not be used about the language syntax must comply with the third person singular and passive verbs should be used, inverted sentences should not contain. The title character, headers top and bottom blanks, figures and tables should be examined for details such as title history, the number of samples should be taken in the articles-articles and articles. The font should be Courier New, 10 point, 1.0 line spacing for text form. Should take place on the first page of the text and other languages ​​major titles, abstracts and keywords. The first abstract, native title, abstract and keywords should be placed under the other language titles, abstracts and keywords. Abstracts should not be more than 250 words. INTRODUCTION must start with the main title and general information about the topic being studied. The importance, aim, and target of work 2. RESEARCH SIGNIFICANCE the title should be explained. EXPERIMENTAL METHOD-PROCESS; ANALYTICAL STUDY AND/OR SUBJECT title should be explained the experimental methods used in the study. RESULTS AND DISCUSSION the experimental methods in the header work, and outputs the data obtained as a result of must be specified both original writings and statements and both graph drawing. CONCLUSIONS AND RECOMMENDATIONS may be in part the result of work and work done in accordance with recommendations. Article Technical Presentation Format must be in accordance with the principles outlined below. The referee should be stored in the article will be sent to the author (s) names do. Author names must be specified after the completion of the arbitration process related articles. Thanks should be as short as possible, it should be noted contribution to the study and support the people and organizations. Note should be given thanks, results of and. In this article, all resources should be utilized in brackets at the end of the sentence in brackets number or name of the author, date: page number system. Example, [1, 2, and 3] and/or (Falcon, 2007: 46). The articles published in the magazine-articles can be quoted on the condition cited. It is recommended that reference be made to the journal's author, article title, volume, year format. In addition, the last access date should be given in parentheses article. Plagiarism (plagiarism), and in accordance with the ethical rules, quotations should be given in parentheses immediately at the end of sentences, and should be supported with a quote reference number of sources. References should be indicated in the list if you have the resources to do the DOI number. If the source article: Author's surname, first name, initials, other authors, (date), "the full title of the article", journal name, volume, number, start and end pages. Ekinci, C.E. and Yildirim, S.T., (2004). Water-Moisture in Concrete Foundations and basement insulation Importance of Curtain. Journal of Research in Eastern Anatolia Region: DAUM, Volume 2, Issue 3, pp: 11-17. If textbooks or reports: Author's surname, name initials, other authors, (date), "the book's name", volume number, if editor, where the name of the publication and broadcasting organizations. Ekinci, C.E., (2003). Isolation Techniques. Istanbul: Atlantic Release Distribution. Report Source: author's surname, name initials, other authors, (date), Report Name, the congress, conference or symposium's name, the place, the broadcast method. Ekinci, C.E. and Eminel, M., (2004). The True Face of Isolated: Elazig, and Yozgat sampling. Insulation-Energy Audits for Sustainable Environment Congress and Exhibition. Istanbul, Proceedings, pp: 331-338. If Source the thesis: Author's surname, first name initial, (date), "a thesis called" degrees offered, the institution. Yildirim, S.T., (2002). Of Fiber Reinforced Concrete Investigation Performance Characteristics. Unpublished PhD Thesis. Elazig: Firat University Institute of Science and Technology. In addition, you can use the source representation of published articles in the archive section. Surname1, A1., Surname2, A2., and Surname3, A3., (2010). The main topic of the article. NWSA: Education Sciences, Volume 5, Number: 9, pp:---. Surname, A., (2010). The main topic of the article. 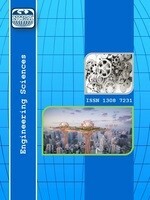 E-Journal of New World Sciences Academy: NWSA: Education Sciences, Volume: 5, Number: 9, pp: ---. If the references display is made using EndNote style, you can access it from the link here. Articles will take place pictures, graph, equation, tables, figures etc. should be prepared carefully computer environment. Articles that will take place in graphics, images, equations and figures should be larger than 15x15 cm and a JPEG. Tables, pictures, graphs, figures and such studies should be inserted into the text should be in place, number and title of each individual should be given to and the title should be written in English-Turkish. Tables should be in the form of classic tables (rows and columns stripes). Tables should not be in a horizontal position. Page that does not fit tables for given table of contents in a smaller font size. Vertical format that does not fit table and/or shapes should be minimized or table should be redesigned as two different tables or figures. Equations should be numbered and the numbers shown in parentheses at the end of the line. Text should be used in SI units only. In the journal with text, shapes, pictures, and graphics as well as arguments put forward by all the visual material and legal responsibilities belongs to the author. Journal does not accept responsibility. Tables should be in the form of classic table (with columns and rows), centered in the place position, just above the title. Figures should be in place to be, and so centered articles in the "Courier New". Figure white papers must have at least two different languages ​​and below the figure.